Down the road a few blocks is Buster Burger, a favorite lunch spot for many in our office. The patties are juicy, the buns come fresh from a local bakery, the fries taste homemade, the walls are full of pictures of those who conquered eating contests, the owner friendly, and the environment electric. Today, a couple of us went there to get our burger fix. A U-Haul was the only vehicle parked in front of its doors. The owner was carrying equipment from the restaurant and loading it into the back of the truck. We talked to him for a minute outside of the doors that he was about to lock for good. For a year and a half, he had put his heart and soul into building something that provided a unique, local experience and one of the best burgers in Salt Lake City. He was broken hearted, not as much from a failed business experience, but from having his dreams dashed. For me, it was almost like losing a dear friend. “Well, the end of our dream is here. I can truly say it was a dream and we had an absolute blast living that dream. I once heard that to dream and never follow that dream is to never have lived at all. Many restaurants have a hard time keeping their doors open. It’s one of the toughest industries to get business financing. But regardless, Buster had a great product, provided an awesome experience, and seemed to have a more-than-good chance for success. Up the road from Buster is a Wendy’s, McDonald’s, Apollo Burger, and an In-N-Out. Each of those franchises are packed every day, even though they don’t provide near the quality of the local burger joint. Even if just a small percentage of those customers went to Buster instead, Buster would likely still be grilling burgers. Buster Burger is a microcosm of small business across the country. To help this economy, Main Street America needs to thrive. And to do that, in the end, people need to do more commerce with small businesses at the local level. … Sales tax, restaurant tax, employment tax, water reclamation fees, grease trap fees, water fees, sewer fees, permits to hang a sign, city workers that show up ten minutes after you put up a sign to tell you that you can’t (where were they hiding anyway), building permit fees that ultimately make sure that if something is done wrong in building your business or home, they guarantee to do absolutely nothing…. I am sure that individually, each one of these serves a purpose, but collectively, not so much. … Restaurants require a lot of time. To say the least, it will be nice to get back to the old days of just 60 hours a week. … there is no short of business that will “help” you grow your business. I found that it is a similar to poker. You have to play the hand you are dealt and luck is a big part of it. Ultimately, if you survive long enough, you learn some tricks specific to that game, but no matter what, you will lose some hands. You just hope that the hands you win outweigh the hands you lose. And to those daily deals businesses…..Don’t use them unless you are a service oriented business. Otherwise, it is quicker to just put a sign on the door that says 75% off everything. What do you think? What are the main challenges for small businesses? Do we need to do more business with local stores, shops and restaurants? I always hate to see a small business close. You know that over the last ten years, I have struggled as a small business owner. I too, had restaurants. Five of them. I ended up more broke the day I closed my last one then the day I opened my first. If I could pinpoint a reason I closed, I would say that everyone of them were plagued by the same thing: an apathetic customer base who was more concerned about the national brand specials then keeping a local business open. At one point, I employeed 29 people. Not huge, but big enough to pay a higher tax wage, and small enough to miss any tax breaks. I feel the government should give tax breaks to small business. Let SB grow the economy by giving people jobs. I also found that people don’t understand what value is. Value isn’t having the cheapest product. It’s having the best product available for a fair price. Five dollar pizzas are not value. They are cheap. And you will need three of them to feed your family. I charged 12.99 for an 18″ pizza. Enough to feed an average sized family. Two bucks cheaper then buying three from the other place, and lots better. It’s sad to see places like Buster Burger go. As an owner who lost, I don’t blame the big guys however. The blame must land solely where it belongs. On the shoulders of a public who will not support local business. Chad, good to see you comment here. You have some great insight into being a restaurant owner. If you don’t have a restaurant, what are you doing now? In Europe, its the chains that suffer in competiton with the local eateries. The fact is that laws in countries such as Italy are actually stacked against franchising. In a free economy such as ours, and in this sad case, the answer remains…location, location, location. And convenience: easy parking, drive throughs. The local “Cook Out” fast food in Raleigh-Durham, NC is a prime example of how to position oneself and the big franchises: not next door, all drive through, clearly visible locations. As a small business owner I sympathize with your plight but I disagree with this sentiment. We can beat our heads against the wall because the public chooses big chains over our (often better quality) products and services. Or we can take a harder look at ourselves and learn lessons. We can’t force the public to support local businesses. When most families go out to dinner, they just want what’s familiar, tastes good, and has an atmosphere they enjoy. Simple. I can’t imagine anyone leaving their home with the sole motivation to support small local business. That’s noble, but an unrealistic expectation. It’s not the public’s fault. Take responsibility for your business failures and learn from them. The problem isn’t how to wrestle away business from the big chains. You can’t compete on price. You can’t compete on visibility. So focus on what you can do that big chains can’t. In my small town, there are several restaurants that have been open for over ten years, some thirty years. There’s also a Subway, McDonald’s, Olive Garden, and KFC. How do these small business owners thrive? If I were going to open a small restaurant here, I would go to those business owners who have had longevity and ask them what they did (or do) that keeps them going year after year. Instead of blaming business failure on the public, take some time to educate yourself. And please try again. Never quit. Couldn’t have said better myself. Excellent answer. I took a position at a culinary school teaching. I also have started a small process serving firm with my wife and brother. Working on being financially independent through capitalism and entrepreneurship. I took my kids on Saturday, which sadly was the last day for Buster Burger. As I sat savoring my last burger with my kids and I explained they were closing they could not believe it. Buster Burger’s product was always consistent and flat out GOOOOOOOD! They won several local burger competitions against ALL the bigger and more well known brands, but with only one location and no drive thru window they closed the doors. It is very sad that a ‘local’ burger joint with so much to offer could not make it. It is estimated that 95% of small businesses do not make it 5 years. I spoke to the owner who said he had more capital to put in but it was not worth the hassle. This is a tough market to enter. I am afraid that in many instances when the initial business plan and the estimated revenues are written up for a new business we don’t fully realize how tough it will be. 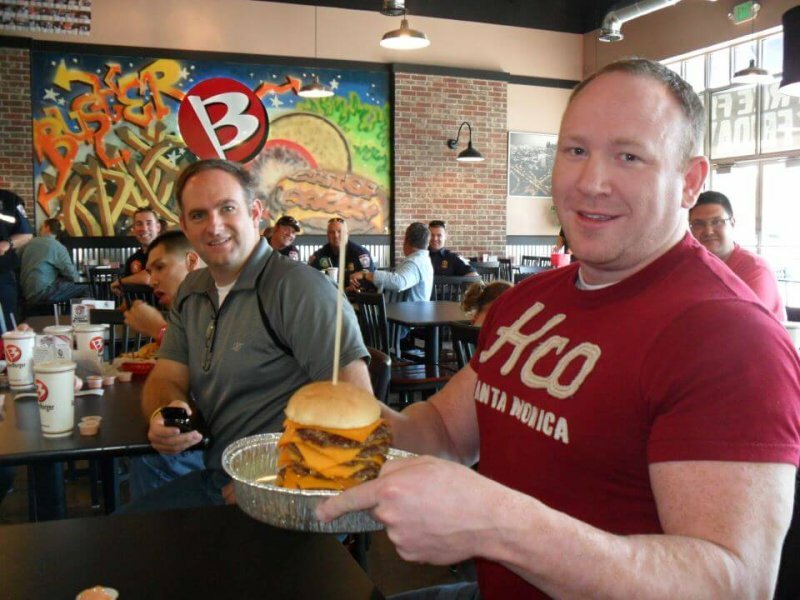 As Buster Burger proves, many businesses require longer than 18 months to build enough clientele to be profitable. This Saturday November 26th is Small Business Saturday, support your local merchants and save some of your holiday cash from the Big Box Retailers! Though I am very sorry for the business owner and closure of his business, I would like to point out that I live in the area and neither myself nor my husband (who is a BIG burger fan) have heard of the establishment. I like supporting small business, and I try to learn about local places by looking in the community newspaper and city coupon pages that get delivered to my door. And of course there is word of mouth from friends and neighbors. So the fact that this business, which is just a few miles from my home, opened, served, and closed without me ever hearing about them, makes me question the quality of their marketing strategy. I may be playing devils advocate, but how can the public support a business that they don’t even know exists? Responding to Brieanne…I am a small, independent restaurant owner and I hear the same thing all the time about my business and other small businesses regarding not being known. Unfortunately, a small, indy restaurant does not have an unlimited marketing budget and cannot always get the message to the entire community. We tried being in mass coupon mailers (didn’t work – very expensive,) have tried direct mailers (waste of resources – very expensive,) get where I’m going here? There are so many marketing options, and finding the right mix for an affordable price is difficult. As much as it is up to a business owner to market, I believe it is also time for citizens to get off the computer, out of the house and actually go and explore their communities. Many small businesses are clustered or in a downtown area…get out and look. Find a treasure. Support somewhere you’ve never heard of. And just be honest…even the businesses you’ve HEARD of you probably pass by on a regular basis and just keep driving or walking by. We hear all the time how unique we are and an asset to the community and have great food, service, etc…then we don’t see those folks for another couple of months. Supporting a business means showing up at least a few time per month. One of the most overlooked marketing specialties is cause marketing. An owner can promote a cause that is passionate to others and link their business to it. My cause was fixing Detroit Public Schools. I received newspaper quotes for articles, radio show interviews, television spots and last year a three page article highlighting my activities in Essence Magazine, a national African American Women’s magazine reviewed by 7 million African American Women for my volunteer hours. I estimate the FREE PR would have cost me 2 million dollars over the past 10 years. Ida, that’s great insight. Buster also did a lot of things for local elementary schools as well and provided lunch for a lot of kids. But, I’m not sure if they capitalized on those PR opportunities very well. Michele, can you tell me more? I’m not sure what you’re asking. As a former restaurant general manager and direct marketing specialist I can confidently say, if you thought direct mail was too expensive, you were doing it wrong. First, separate advertising from marketing and branding. They get thrown in the same bucket, but are not the same. Branding is establishing a name/reputation that make people recognize your establishment before your advertisement arrives. Within the Salt Lake marketing, look to In-N-Out Burger. Due to reputation from travel to California and word of mouth, people lined up at the local grand openings. Personally, I didn’t get it. My visits to In-N-Out in California were good, but did not warrant the hype. Yet, when the local franchise opened people fell back upon their “mental muscle memory”. They had convinced themselves In-N-Out was fantastic, so they had to go when the new locations opened. I will share more in the future how small businesses can overcome “mental muscle memory”. Darren, please do share more. Want to write a guest post for us on overcoming mental muscle memory? Sounds interesting. This is in reponse to Brieanne’s comment. If you live just a few miles away didn’t you ever see the location? ScottY, since reading this story, I have found the location of this restaurant, a few miles to the Southeast of my home on a street I drive probably once a month. It was located in a strip mall with a bunch of other businesses, with nothing to make it stand out. I regret that I didn’t notice it on previous travels, but I challenge anyone who says they notice every name on every business complex they drive past, logging when new businesses open. Speaking in general now, if you are planning to enter a highly competitive and crowded industry, you must do more than simply hang your name on a building and expect the public to seek you out amidst all of the competitive clatter. Small business is what has grown this country and employs the most people. If consumer’s would make a wiser decision when shopping or eating or buying things, they would keep more money in their local economy. We had a recently opened Olive Garden and the parking lot has been packed, I hear 1-2 hour waiting. While the local owner’s place remains with little traffic. People need to stop and think before making a buying decision. If we build it they will come? NO…seldom happens. Sadly, the guy who opens the local business is in the minority of the population that believes we need to support the local guy. Nothing is , sadly, further from the truth. Society in general has the “wal-mart” mentality; how cheap is it? that’s what the general population wants….cheap, quick and lots of it…and so the big national guys market “cheap”, and the “sheeple” swallow it. Kathryn, consistancy IS important, I agree. But…at the end of the day, I’d rather be passionate about what I serve. I can appreciate folks being in a hurry, but theres always time for a GOOD meal at a resaonable price. I wish the folks at ” Burger Buster’ and thousands of others , everywhere who have failed and will fail in the future best wishes, however as a practical lesson, it should be a ” Cautionary Tale ” to everyone who has not done their Homework before starting any type of Business ! ( 1. ) Slow Down, ( 2. )Take the Time to Study Your Prospective Industry, ( 3. ) Sit Down with some Good Business Planning Software and spend a reasonable amount of time ( 60-90 Days ) researching, considering Contingencies, Find Out Local, State and Federal Regulations that could affect Your Business, Negatively and Finally , Sit Down with a Good Adviser ( S.C.O.R.E. comes to mind ), Plan Your Tax and Legal Needs, Find a Appropriate, Affordable Location that You can Own , ( with a SBA Loan ) and then Proceed Cautiously upon Your New Venture and Work Your Tail Feathers Off becoming an asset to Your New Business Community ! What is SBA’s definition of a SMALL business concern? Micro business can’t afford 1 to 2 full time employees to keep up with the bureaucratic regulations and fees. The government needs to get of the way of the micro entrepreneurs so they might grow to become a small business! Buster, first and foremost my sincere best wishes for your NEXT dream! Buster Burger did not fail in the sense that it lost something or lessened you personally…it suceeded, my friend because YOU were there, you did what you could, YOU tried! I own Zippy’s Pizza, Wings & Things in a small Texas town (boy! try competeing agianst BBQ in TEXAS!!!) and every day is a day of choices…rent, food, payroll. Liscense fees, state taxes, electricity, paper goods, you name it we struggle with it every day. Do I pay the taxes today or the rent? How much money is in the bank? Can I last one more day? We serve the absolute BEST handmade, oven cooked pizza in Texas and we serve it to an audience of few…few who realize that we care what we cook, that we are passionate about how we treat our customers and that we love the fact we are pizza in this town! I’m sorry to see you go, Buster and even though I dont know you, I know who you are and what is in your heart. Ralph, I really want to try your pizza. I’m salivating. I’m so disappointed to hear about Buster Buger. My husband and I recently opened a hunting and fishing store in a small town Smithfield, NC. Just like you it seems our competitors have the local bank in their back pocket. They even advertised for them in the local paper. My husband still works full time (70+ hours a week) at his regular construction job and I really run the store alone (with our kids). We’ve done okay but not well enough for the store to “survive on its own”. We are aware of the hard work it takes.. but sometimes I can’t help but wonder where is all the money Obama boasts about that’s available for small businesses?? Certainly NOT at a hometown bank.. Much success to ALL small businesses.. we will make it!!! Jeannine, thanks for sharing your story with us. Best of luck with your hunting and fishing store. I owned a small catering business in Maryland. I was faced with numerious fee’s. When people say labor is your highest cost they better take a second look at what the State, County, and Town charges. I never could break even. I treated my employes well, helped local schools and gave to special needs. After 14 years, and Fee’s getting higher and higher each year I had to close my doors for good. What a sad day for our town. The State of Maryland is not for the small business owner. Those fees can be a big hurdle for many restaurant owners. Maryland may not do well for small business owners, but sure is a beautiful state. I love the Chesapeake. Location , location , location. For his next business venture he should open up a computer store next to Apple. Or a jewelry store next to Tiffany’s. How about a hardware store next to Home Depot or Lowes. I personally am opening up a Custom Made suit business right down the street from Armani. Wish me luck guys !!!!!! Good luck, Evan. Hope it goes well. I understand the frustration. I just closed my gift shop business the end of October. Nine years of living the dream (again). As I had very low overhead the way I was set up I was able to really put my money into the merchandise and the “specialties” to make my gift shop stand apart from others and bring a wide array of customers to our small area. I had quite the advertising budget to pull in people from a large area and dreamed of being a real “destination”. The destination part was great but those guests only come once or twice a year and the majoritiy of the local people would rather head out of town and spend money at the large box stores (sure that they were saving $$$$ of course). There is no competeing with the large stores on price and it appears that is the number one thing people are looking for now. Lendio…what can you do for businesses like these? It’s on your site, the problem is that money still does not get into the hands of good quality local businesses that need to scale just a bit to compete. Reminds me of the story of the pizza joint in town that had one location, It was losing money for lack of awareness, they did the counter intuitive thing and opened one up on the other side of town. Crazy! Right? No, the opposite, sales in both went up and they survived. Mike – Former owner of Dimitri’s Pizza in a location near Lendio. Mike, that’s a great story about the local pizza joint. I’d love to highlight that story for our blog, and talk about how important location is and some other tips that restaurant would have. Is that your story? Want to write a guest post about it? As for what we can do for businesses like these: We can help some get the right capital. We’re matching business owners with thousands of different types of loans and other financing. And we’re totally free for business owners. For Buster, capital didn’t seem to be the issue. He told us he had more financing he could pull from, but he said it just wasn’t worth it. No Dan, that story was not ours, ours was the other story about a local pizza joint that didn’t make it. What I learned from that experience was to transition to a better business model. One that is web based, scalable, and can be run from a laptop anywhere in the world. That is what we are pursuing now, and unfortunately Lendio went the other direction to hook up the 95% main street business to lenders vs the tech 5% that are looking for Angel investors and not the traditional SBA, bank, loans. At least that’s what Brock said in the “story video” on your site. So, if you know any tech Angels, we’d be interested. Choice of business model is so important, service vs retail (Buster’s) vs web-based scalable. I’ve started all three and the last one makes the most sense based on our circumstances. Mike, thanks. You’re right, we turned our focus to debt financing instead of equity. We still have good contacts with investors, however. I’d send an email to [email protected] to see what we can do for you. If not, best of luck. My girlfriend and I are finishing up college and we believe so strongly in local business that all we want in life is to start our own business and do good old fashioned hard work to be happy and feel like we’ve accomplished something. We have been processing ideas since a year and a half ago, researching pretty much everything we could get our hands on. This is all we talk about all day everyday and we are on the verge of making a physical move to start our idea. But we read things like this and are so terrified of failure and long lasting debt that keeps us from trying again if we do fail. You talk about all these taxes and regulations, and cause marketing and SBA’s, but I (being someone who is fairly intelligent and ready to start a business) am so freaked out by the state of the economy and the style of bullying that our government does. What can you offer, someone like me, in the way of advice? Good luck. Let us know how the journey goes. Almost 2 years later and here I sit at 2:45am thinking about Buster Burger. I used to frequent it often, always telling anybody that would listen that they had to try Buster Burger, best in Utah. There is still a burger sized hole in my heart, have yet to find another to fill it. Losing Buster Burger was like losing a friend, I have often daydreamed about opening a burger joint and when Buster went under it felt like my hopes and dreams were dashed as well. They had a devoted following, wish more people would have gone. Here is to you, Buster Burger, we all miss you. I invested well over £100000 in a burger business in a small town in the Cotswolds, we did very well for ten years until the arrival of a well known American burger business which built a large drive through on the edge of town. Despite many of my regular customers saying they would remain loyal and not to worry, we eventually had to close. It cost me a small fortune in paying my staff redundancy .